World 2- is the fifth level in Desert Land, accessed by clearing World 2-3, and its own completion will allow the player to access worlds 2-4 and 2-5. The level is a long desert with many quicksand pits and an Angry Sun looming over for most of the stage. Some of the quicksand pits has Venus Fire Traps placed within them. Halfway through the level, there is a Tornado that will carry the player backwards a certain distance if they get trapped within it; to avoid it, the player has to run and fill the Power Meter and jump to clear it. 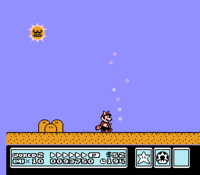 Shortly afterward, the Angry Sun will start swooping down, attempting to damage the player, and the player has to avoid it for the remainder of the level while dodging enemies and other obstacles. This page was last edited on September 6, 2018, at 20:34.